Doris Days Out is a family business run by mysef Lisa Boxall and my husband Alan. We pay particular attention to your personal requirements to ensure that your special day remains in your thoughts forever. I am the planner and organiser for your event and take a huge amount of pleasure in seeing that your expectations are fully met. We are equiped and prepared for all types of last minute emergenies that a bride may encounter on her way to the church. Umbrella for the unepected shower down to needle and cotton just in case something needs stitching. Alan is the chauffeur and takes great care of Doris as he did all the restoration work to get her looking as immaculate as she does. Not only that but Doris is getting on a bit and needs some TLC occasionally. 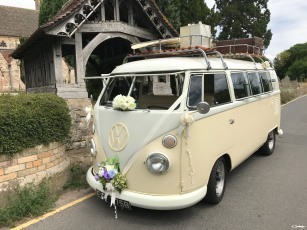 Doris is a 1964 split screen VW Camper van, she comfortably seats 5-6 people in the back on the newly upholstered custom white & cream curved seating. Her exterior is white & champagne two tone colouring and she has the Champagne on ice just waiting for you! Doris is the ideal transport for any occasion; be it Weddings, Prom Nights, Race Meetings, Birthdays or Anniversaries it can even be just a night out on the town! 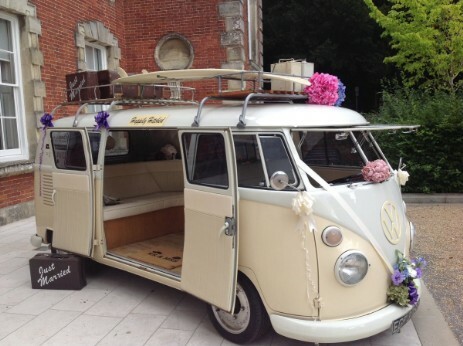 Doris was born from a vintage relic and is now a retro cool & funky form of transport. Take a look at her restoration! She really is the perfect entrance to your special event. An experience that's priceless, gets heads turning, and puts a smile on your face! Details of future wedding fairs and events will be posted in due course. We would like to thank everyone who has visited us at events during 2018 and we hope to see some of you again soon. City Hall Wedding Fair Sunday 10th March 11am to 3pm.